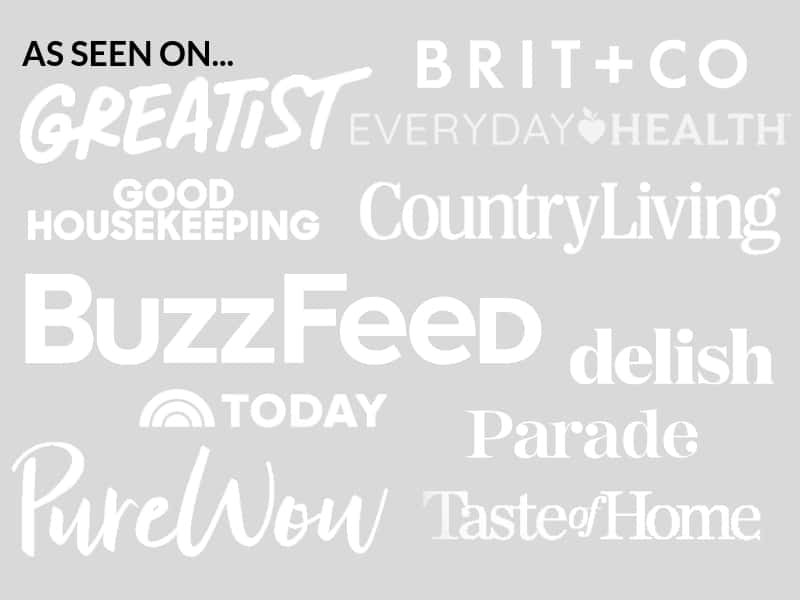 January 24, 2019 By Elizabeth Lindemann 18 Comments / This post may contain affiliate links. 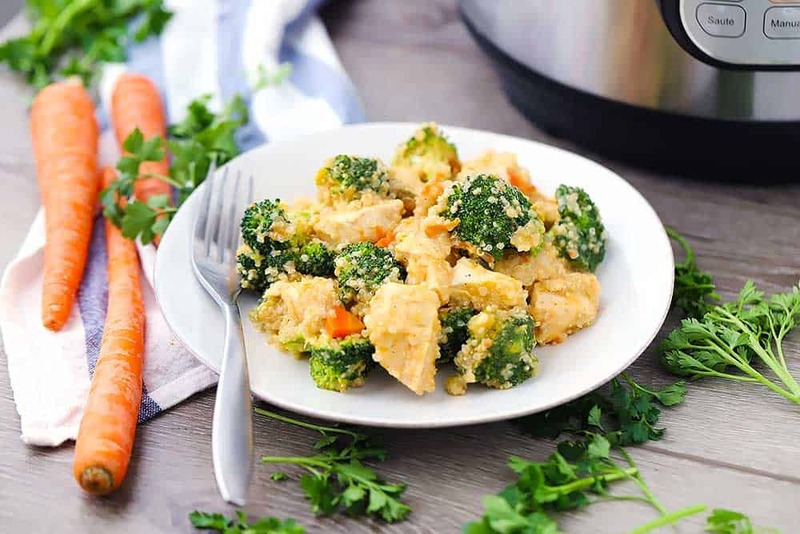 This Instant Pot Chicken, Broccoli, and Quinoa recipe has melted cheddar cheese in every bite. It’s packed with wholesome ingredients and is total comfort food. 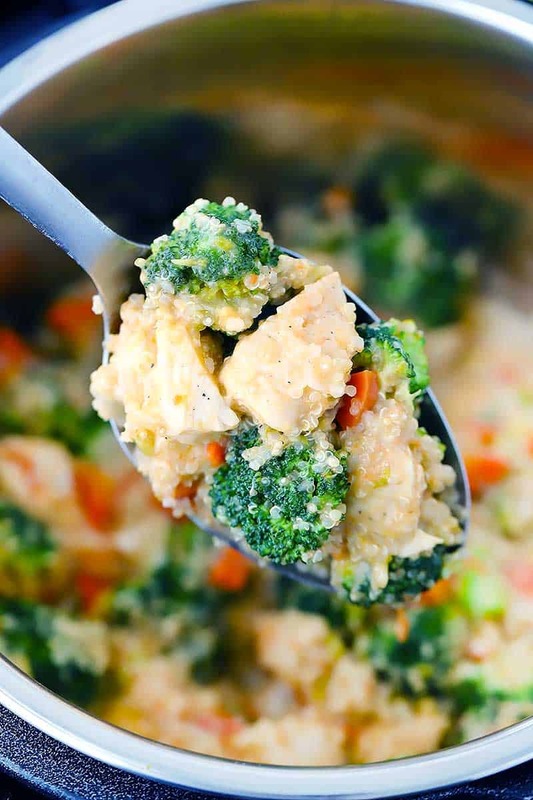 It tastes like broccoli cheese soup, but in casserole form, with chicken and quinoa added. YUM! The instant pot makes easy work of this recipe. While it won’t save you THAT much time compared to making it on the stovetop (see notes in recipe for how to do this), there’s something great about the “set it and forget it” method of Instant Pot recipes that makes them so appealing. You don’t have to pay attention to stovetop temperature, and you don’t have to stir to make sure it isn’t sticking or burning on the bottom. Here’s the thing about Instant Pots: unless you are cooking something that usually takes a LONG time to cook (such as dry pulses in this Split Pea Soup or a really tough cut of meat, like pork shoulder), pressure cookers generally don’t save a lot of time. Sure, you can technically cook chicken meat in 5 minutes. BUT, that doesn’t account for the time it takes for the Instant Pot to reach pressure, which can sometimes take 15-20 minutes depending on the recipe. But I LOVE how easy it is to walk away from the Instant Pot without giving it a second thought. I love that you can keep whatever you are cooking in it and it will stay warm- close to piping hot- until you are ready to serve it. And I love that you can sauté directly in it, unlike most slow cookers, so it’s easy to use it for one-pot meals. 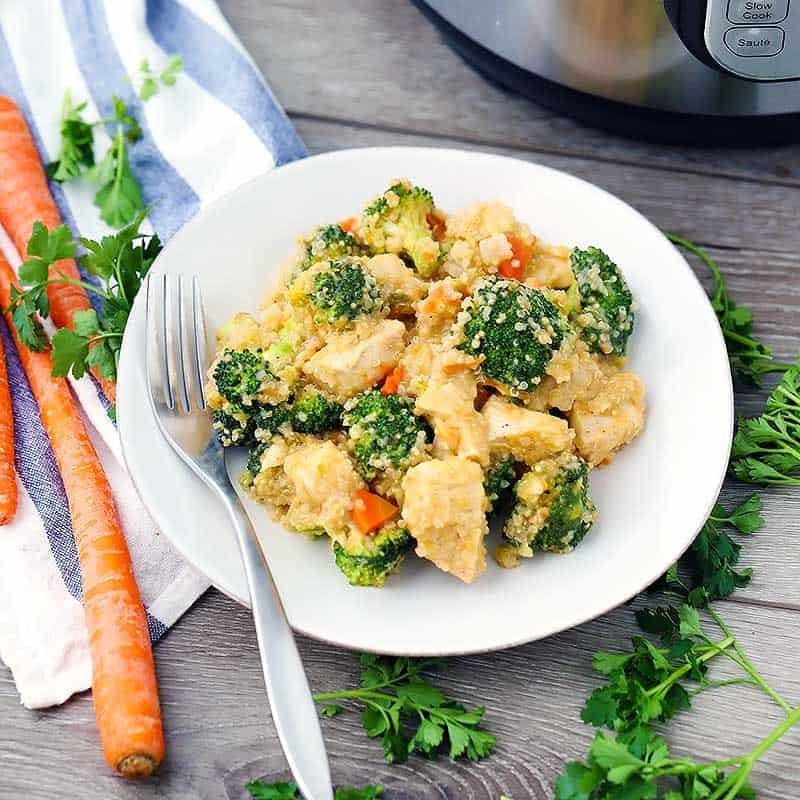 For this Instant Pot chicken, broccoli, and quinoa recipe, you’ll first sauté the aromatics (onions, celery, and carrots) in butter (which smells so insanely good). Then, just stir in some quinoa, chicken broth, and chicken breast pieces, along with generous amounts of salt and pepper, and cook for five minutes! Of course, 5 minutes in instant pot time really means more like 10-15, but still. Super fast and easy. After it’s done cooking, just stir in some shredded cheddar cheese and broccoli florets. Cover, and allow to sit for five minutes. The residual heat and trapped steam will soften the broccoli to crisp-tender and melt the cheese to perfection. The first time I made this, I used tri-color quinoa. The second time, I used white. You can use whatever kind of quinoa you want. But while tri-color may be prettier, I do find that white quinoa tends to cook faster than other colors, so if you use tri-color, you may have some pieces that taste a bit crunchy or underdone. It just depends on your preference. By the way, did you know that quinoa is actually a seed, not a grain? True story! Although, it’s considered a whole grain for most culinary and nutritional purposes. It’s high in protein and other vitamins and minerals, and is super good for you. One quick tip: make sure you clean, or at least soak, your pressure cooker liner immediately after serving. Since this recipe has cheese in it, it will be difficult to clean if you let it sit for too long. If you like this easy Instant Pot recipe, here are a few more you’ll love: Instant Pot Split Pea Soup, Instant Pot Pulled Pork, and Instant Pot Pumpkin Chili. 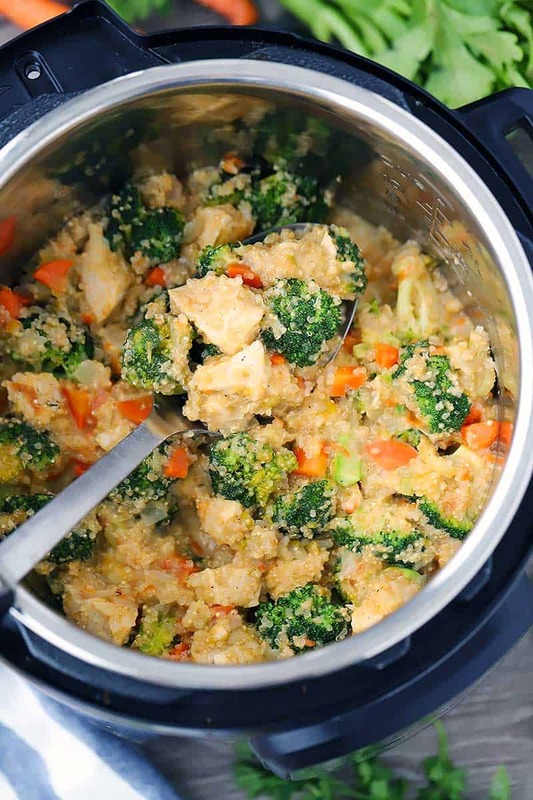 Here’s the recipe for Instant Pot Chicken, Broccoli, and Quinoa with Cheese! 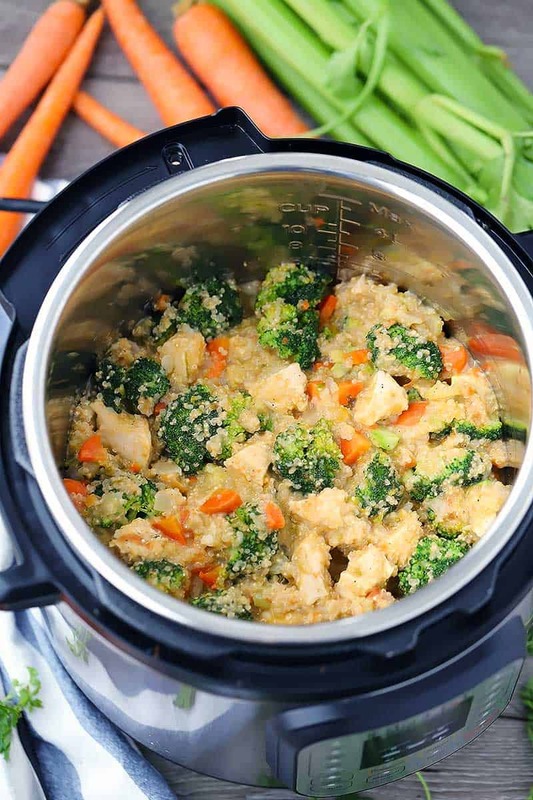 This Instant Pot Chicken, Broccoli, and Quinoa has cheddar cheese melted into every bite. 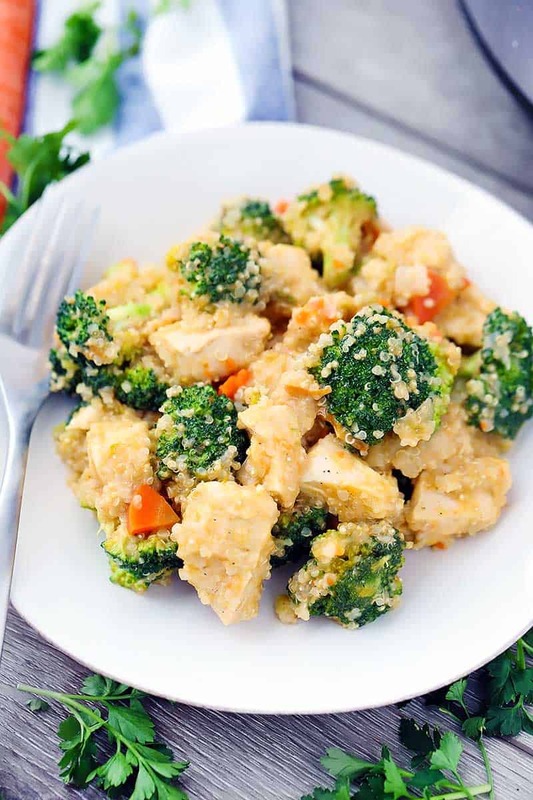 It's gluten-free, family-friendly comfort food made with whole grains, lean chicken breast meat, and packed with good-for-you broccoli. Turn your pressure cooker to the "sauté" function. Melt the butter and sauté the onions, celery, and carrots for 3 minutes, or until beginning to soften. Add the rinsed quinoa, stir to coat. Pour in the chicken broth and add the chicken pieces and stir to mix together well. Turn the "sauté" function off. Cover the instant pot and set manual pressure to "high" for 5 minutes. Quick release the pressure and wait for the float valve to depress. Stir in the broccoli and cheese. Cover and allow to sit for 5 minutes, or until broccoli is crisp-tender and cheese has completely melted. To make this on your stovetop, sauté the onions, celery, and carrots in butter over medium-high heat in a large skillet for three minutes. Add the chicken with salt and pepper; sauté for three minutes more. Add the quinoa and chicken broth, bring to a boil, cover, and simmer on low for 20 minutes, or until quinoa is almost completely cooked. Stir in the broccoli and cheese, cover, and cook for 5 more minutes, until broccoli is tender. Serve. This recipe can easily be made dairy free by omitting the cheese and using olive oil instead of butter. This recipe first appeared on Bowl of Delicious in February 2018. I’ve updated it with new photographs and tweaked the recipe in response to some user comments and questions. Love how quick and easy this was to make! My family prefers food with a touch more seasoning so I added a dash of garlic powder and about a half teaspoon of yellow curry powder, yum! Sure, why not? I think it would work fine! I think frozen spinach would be great, too. Made this tonite, going to take it for lunches at work this week. Turned out great, really like it, only problem I hit was after I stirred in the broccoli and cheese, I got the BURN warning before it was done, and it was definitely burned on the bottom. Not sure if I should have added more chicken stock or just poured the broccoli and cheese on top and not stirred it. Definitely going to make again!!! So happy you liked it! I’m going to cook this again this week because so many people have gotten the burn warning and see what I discover and update the recipe. I’m thinking that I’ll either set the IP to “0” instead of “1” for the time for the second cook or just not pressure cook it at all for the second round! I made this last night, and it turned out perfectly! I used white quinoa and did not get burned. I used frozen broccoli florets that were mostly thawed. Perfect!! 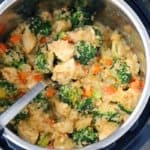 I shared the recipe with all my Instant Pot friends! So happy you liked it! I’m actually planning on making it tomorrow with white quinoa too. I used a Quinoa and brown rice blend, I also got the burn message. Wondering how long I should let it sit with the lid on? How frustrating, sorry you got the burn message! Since writing this recipe it’s come to my attention that some of the newer IPs are more sensitive to the burn warning. Next time, I’d try adding a little more liquid. Hope that helps! Mine burned during the second pressure cook. Tips on avoiding the dreaded burn warning? Thanks! Made it. Loved it. And it reheats great! What are the serving sizes for this and how many servings in this recipe? Hi Carly! Sorry for the delayed response. This recipe makes about 6 servings. Hope that helps!